The reason I got the one I bought is two-fold: it had a mobile device holder big enough for an iPad mini (a lot of my at home photos are taken on the mini) AND It also had a regular, standard tripod/monopod attachment, so I can use it with my gm5 and get those over-the-crowd shots I can't normally get, being short. Oh, and it has a mini tripod attachment. Seemed like a win-win, even if I don't use it for selfies. But of course, I did use it for some selfies, pretty much immediately. 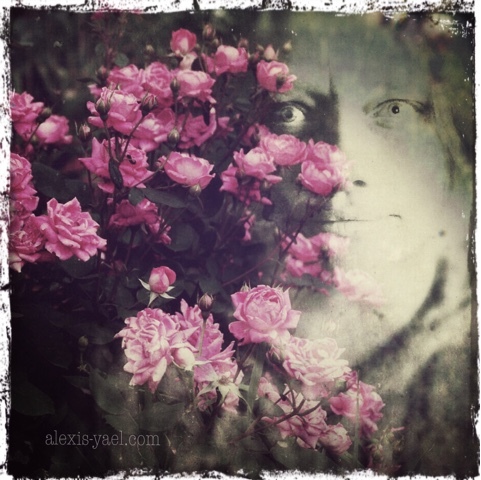 And then I created this double exposure with the selfie and some roses from yesterday's photo walk. Because that's what I do.